After polishing a lot of white metal parts, including the entire frame, to a high luster, Tom coated the body with Tamiya's beautiful Camel Yellow paint and lots of clear top coat. 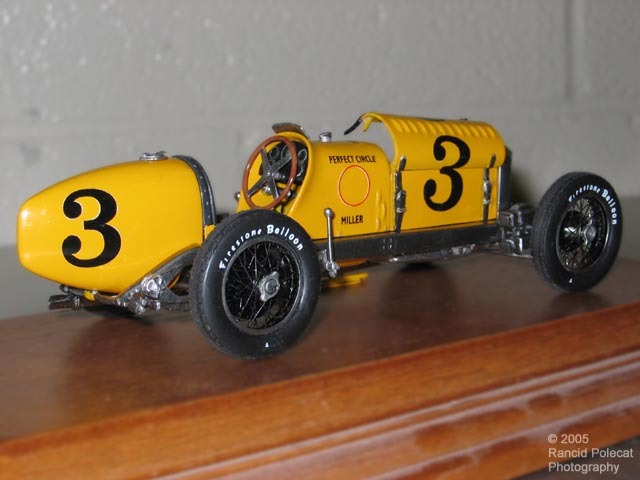 He sourced the decals from an Etzel's Speed Classics Miller 91 Rear Wheel Drive (RWD) kit of a similar vintage. If you look closely at the front tires, you'll see that they tilt out at the top. Race cars in thise days typically used this positive camber setup. Although every club memeber who took a close look at those spoked wheels assumed they must've been a bear to assemble, Tom told all they weren't so bad.